I used to scoff at my husband for offering fruit for dessert when we were newlyweds. “Fruit is NOT dessert!” I would declare. To me, dessert was something forbidden: sweet, filling, and rich, like cookies and cream ice cream, brownie sundae, chocolate chip cookies, or piece of chocolate cake with chocolate frosting. I used to look forward to such sugary treats at the end of a meal. My awareness has taken me on this food journey and I would now choose a fruit dessert over an ice cream sundae with all the toppings every time. Here is an appealing way to dress up a delicious apple by willing it with goodness. Preheat oven to 375 degrees. Hollow out the core of the apples, leaving the bottom of the apple intact to hold the filling. Place apples in greased baking dish. Mix together raisins, almonds, walnuts, miso, tahini, molasses, cinnamon, vanilla, and flax seed along with 1/3 cup of apple juice (reserve the remaining 1 cup of apple juice to pour into the baking dish and over apples before baking). Fill each apple with the tahini mixture. Pour apple juice on the stuffed apples and into the bottom of the baking dish. Bake for about 1 hour. 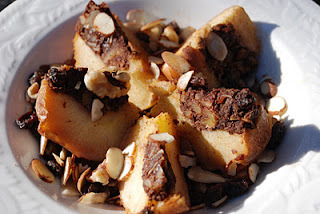 Top with slivered almonds, raisins, sprinkled cinnamon, and enjoy with almond milk if desired.